Posted on May 28, 2018 by Norwich Radical	in Inter|national and tagged Africa, corruption, demostration, dictator, dictatorship, eulogy, featured, Itai Dzamara, media, movement, newspapers, occupy, occupy wall street, petition, protest, repression, robert mugabe, violence, Zimbabwe. Occupy. Regardless of what you think about the movement’s longevity, potency or efficacy, it was hailed as the start of a new wave of activism that was so desperately needed, protest that would reinvigorate the oppressed and make the elite ruling class of Western democracies pay attention and take heed. Occupy Wall Street was of course where it all began, and it soon spread to over 20 countries worldwide. There was one country though that found itself besiege to an Occupy movement, news of which barely made it to the international media stage. Furthermore, this relatively modest movement wasn’t aimed at the 1% – the metaphoric representation of a ruling class defined by financial capital – this movement instead took aim at one of Africa’s most destructive democratically elected dictators: Mr Robert Mugabe. The protest was set up by one man, Itai Dzamara. He had had enough of the brutal rule of Mugabe, who oversaw the economic and social deterioration of a proud and illustrious nation having only recently broke free from my ‘Great’ nations’ colonial grip. In 2014 he took to Occupy Unity Square’s namesake, a park in the centre of the capital city, with a simple sign reading “Failed Mugabe must step down”. Soon he found himself joined by a handful of others brave enough to protest against the unjust situation that they and their families found themselves subjected to. 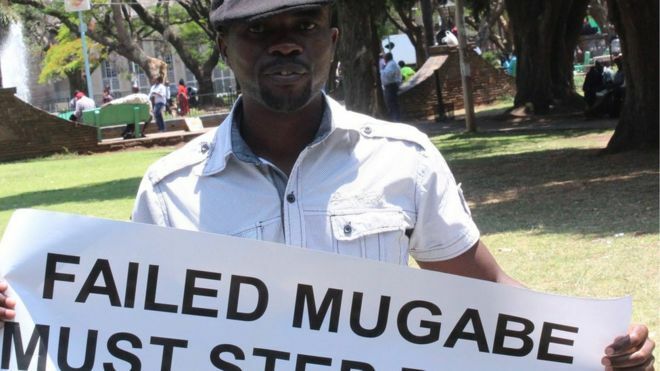 The protest was set up by one man, Itai Dzamara. Unlike the sustained and expansive sit down protests captured by Western media outlets, this was more of an on-off affair with protesters routinely chased away by baton wielding police, only to regroup soon after and return to replay the whole affair over. Dzamara often took a beating, and on several occasions required medical attention and even hospitalisation. Undeterred, Dzamara then organised and hand delivered a petition to the demagogue’s office demanding he step down, claiming he was unfit to run the country that Itai had seen crumble around him. As one would expect, this didn’t go down too well and, following an extended and aggressive interrogation, a brutal dose of corporal punishment was administered once again. This feat of self-sacrifice for the common good of his fellow citizens didn’t go unrewarded, as he found himself the subject of a column in one of Zimbabwe’s leading newspapers, hailed as the dreamer the country lacked and so desperately needed. Sadly though, this would be the straw that broke the camel’s back: 4 months later, on the 9th March 2014, Itai disappeared. Although no definite answer regarding his whereabouts has been offered by the state, it’s fair to say Dzamara is no longer with us. In a country in which mere petitions get you hospitalisation-grade beatings, invoking national media coverage publicising political dissent is likely a death sentence. Itai leaves behind a wife and children, torn between the logical rationalisation of his probable death and hope that he may one day return. Three years on Zimbabwe is starting to look like the kind of place Itai had dreamed of; Mugabe is history and his successor seems, so far at least, to have the genuine interest of the country firmly at the forefront of his tenure as president. If he is/was around to see it I’m sure he’d be smiling. While we will never know what happened to this man, he has to be recognised as a hero. In a country without the protections afforded to citizens in Western liberal democracies, he chose to stand up against a tyrannical and unjust power despite knowing the likely consequences his actions would incur. While I am not belittling the Occupy movement of other countries in any way whatsoever, to stand up and be counted, be beaten into hospital, and to do it all over again and again, and again, takes courage, resilience and sacrifice that today is rarely seen. So here’s to you, Mr Itai Dzamara, may your memory live on in the hearts and minds of all Zimbabweans and all those around the world brave enough to be fighting the good fight.